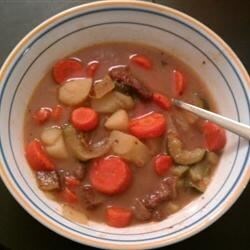 "Beef chuck stewed with potatoes, carrots, celery, onions and beef broth for a homey favorite. The aroma that permeates throughout the house while the stew is simmering doesn't do it justice..delicious." In a large pot heat oil over medium high heat. In a resealable plastic bag mix together the flour, garlic powder, salt and pepper. Add a small handful of meat at a time and shake until well coated; brown in hot oil, about 1 minute per side. Remove the browned meat and continue until all the meat is browned. Lower heat to medium and add onions. Brown onions on both sides, about 3 minutes per side, then remove from pot and set aside. Drain excess fat from pot. To pot add potatoes, carrots, celery, reserved onions, browned meat and broth. Stir all together and bring to a boil. Reduce heat to low, cover and simmer for 2 hours, stirring occasionally. For a thicker broth: 1/2 hour before stew is done, combine 3 tablespoons flour and water in a small bowl and mix well, then slowly stir mixture into stew. This is a very delicious and hearty recipe. It will definitely fill you up! I also took much of the advice of OLIVERCADO. You can find the review by searching under most helpful. Great tasting. This made more than I thought. But the left overs are great. I added some frozen peas near the end of cooking. I'll do this again.